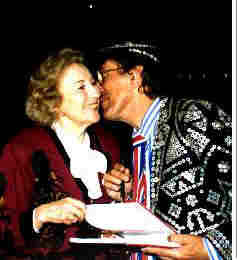 Millions of servicemen have wanted to kiss Vera Lynn ever since she became the forces' sweetheart as a teenager in World War II. My lucky break happened at a Variety Club fund-raiser in Vancouver, B.C. 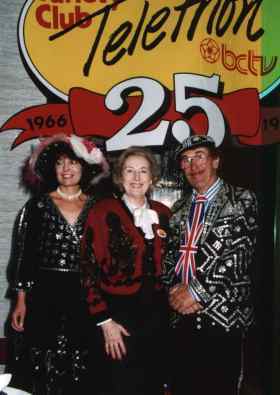 I was there to entertain and Dame Vera was there in her capacity as an officer of Variety Club. We were both at a Variety Club fundraiser before, in Hawaii in 1979. While I was entertaining she listened very graciously and seemed to be enjoying my performance so I summoned up my courage and asked her to sing with me. I was amazed, she got up and sang and I accompanied her in three of her biggest hits, the White Cliffs of Dover, We'll Meet Again and Wish Me Luck As You Wave Me Goodbye. This picture of that moment is one of my favourites. That's me in the blue shirt, I decided not to wear my pearly gear for this occasion, it was her party. In Hawaii the U.S. navy was well represented in my audience and I got to know them, including the guys in charge of the Arizona Memorial so I arranged for Dame Vera and her husband Harry Lewis and I to visit the Memorial. The U.S. navy laid on V.I.P. treatment for us. It was a sombre moment, there are still more than a thousand young men entombed in that ship. 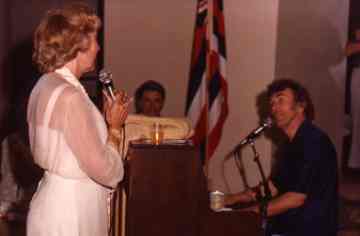 That evening Dame Vera and Harry dined at Churchill's Inn, the beautiful English pub-style restaurant on Kalakuaua Avenue. 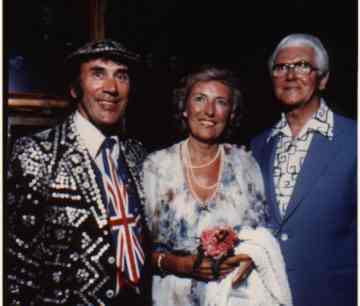 The London Bobby Show took place there every night from January 1978 to the summer of 1980. It was built and managed by Frank Clark, a Londoner who had another successful Churchill's in Edmonton, Alberta which may account for why the Churchill's in Hawaii was always chock-a-block with Canadians. The picture shows an awestruck me, Dame Vera and Frank Clark in front of the Karsh portrait of Winston Churchill.